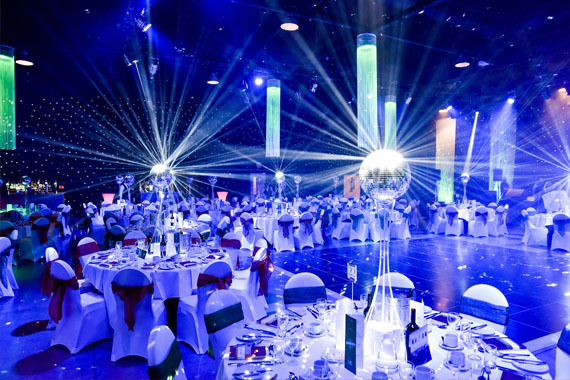 New Dock Hall in Leeds is capable of hosting banquets for up to 1,000 guests or conferences for up to 1,500 delegates, New Dock has now welcomed thousands of visitors from across the country; including quite a few famous faces! New Dock Hall is situated opposite the Royal Armouries Museum in the heart of the vibrant Clarence Dock development in Leeds. It is well served by the national motorway networks with the M1 and M62 only minutes away; getting to Leeds train station takes 5 minutes and Leeds Bradford Airport is only a 30-minute drive. New Dock’s unique and versatile facilities are perfectly complemented by Clarence Dock and its surroundings. There are over 800 hotel beds within a 5-minute walk (including 130 beds in the Express By Holiday Inn next door), and a secure 24 hour manned multi-storey car park for 1,650 cars is literally metres away. Guests wishing to take a step outside New Dock can take advantage of a casino, prestigious waterside retail and restaurant outlets, or just take a stroll and relax by the dockside. New Dock Hall is owned and operated by RAI plc and we would like to share with you the fascinating variety of events that we have hosted already.